A 2011 study by the National Sleep Foundation found that 92% of respondents consider a comfortable mattress essential to a good night’s sleep. Whether that means an all-natural latex and organic wool mattress, a high-tech gel memory foam model or simply a basic, good quality mattress depends on your sleep style, comfort preferences and tastes. Of course, budget plays a big role in choosing the right mattress as well. Fortunately, shoppers in the Emerald City have plenty of great options. There are mattress stores in Seattle specializing in alternative materials, hand-crafted models, and deeply-discounted closeouts. If you’re wondering where to buy a mattress in Seattle, read on. 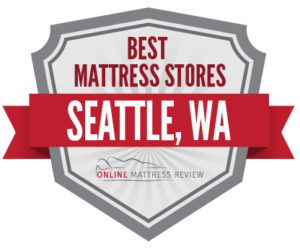 We’ve combed the reviews on multiple sites to bring you the best mattress shops for every style and price point in every region of Seattle. Scope out our guide and you’ll be enjoying a restful night’s sleep in no time. There are a number of specialty mattress stores in central Seattle. Side sleepers who suffer from back pain on traditional mattresses can treat themselves to an unconventional, wedge-shaped mattress at iSideSleep by Squire Sleep Systems (620 N 34th St Suite 219) which is designed to conform to their preferred sleep position. Many side-sleeping customers swear by these innovative mattresses, saying that they relieve back pain and promote restful sleep. Those looking to rid their bedrooms (and the planet) of questionable chemicals can visit Seattle Natural Mattress (4033 Aurora Ave N), which specializes in mattresses made from all-natural materials such as latex, organic cotton and wool. Another all-natural mattress store with an excellent reputation is Soaring Heart Natural Beds (101 Nickerson St #400). This locally-owned mattress shop prides itself on the excellent quality of its all-organic materials, such as kapok, latex, wool and cotton, and handcrafts custom mattresses and beds. Shoppers are encouraged to book a free and private 1-2 hour “Comfort Consultation” to work closely with an in-store sleep expert on choosing the mattress which will provide them maximum comfort and health benefits, and perhaps take a snooze on their prospective purchase as well. Those in the market for a more traditional handmade bed frame, custom foam bed or simply a high-quality, locally-produced mattress can visit Everest Mattress Company (1408 Elliott Ave W), which has been in business since 1949. Mattress Today Seattle (1533 1/2 Northeast 145th Street) gets great reviews for helpful and efficient customer service, winning accolades from customers who don’t want to spend all day selecting, purchasing and installing a new mattress. Those in the market for a custom foam bed, such as a camper, RV or child’s bed, can check out Friendly Foam Shop (12559 26th Ave NE), a specialty store which specializes in custom orders and non-VOC foam. More traditional options for mattress seekers on a budget include Bedrooms and More Outlet (1310 N 131st St) and Mattress Depot USA (823 NE Northgate Way). Both of these family-owned mattress stores operate as no-frills warehouse-style shops, rather than fancy showrooms, but get stellar reviews for friendly staff and highly affordable mattresses. The majority of mattress stores in Seattle are centered in the northern are of the city; shoppers in the south have a limited selection. One highly reliable option is the Mattress Firm in Westwood Village (2600 SW Barton St). Mattress Firm is the nation’s leading retail chain, and this mattress store scores consistently high reviews for its customer service. Customers say the sales associates are highly knowledgeable, and take the time to understand shopper’s needs and help them find sleep solutions without exerting any pressure. Mattress Firm stocks top name brands, and carries a wide variety of specialty products, such as hybrid mattresses, innerspring, gel memory foam, and adjustable beds, making it a popular destination fro customers with sleep problems such as back pain and insomnia. North Mart Furniture (9841 15th Ave SW) sells both furniture and mattresses, all at deep discounts, and customers report scoring deals on new mattresses of half off retail prices. As a liquidation center, North Mart carries a shifting inventory of closeout stock, so customers may find quite a variety of different products available at different times. Those in search of a sleeper sofa, on the other hand, can try Sleepers in Seattle (4741 California Ave SW), which stocks a variety of leather, fabric and sectional pull-out beds. While the West side abounds in mattress shops, there are surprisingly few mattress stores in Seattle on the East side of the city. One of the only places to buy a mattress in the area is Dixon Used Furniture (1915 Rainier Ave S). The store takes a hip approach to resale, specializing in contemporary, mid-century modern, Victorian, and Scandinavian style furnishings, and emphasizing the environmental impact of buying previously-owned goods. Buyers here can score a highly affordable mattress, but would do well to check back frequently to find a model that suits them, as the inventory turns over rapidly. Another budget-friendly choice for mattresses and furniture in West Seattle is Saver Furniture (6464 Martin Luther King Jr Way S). This store carries new and affordable mattresses, including gel memory foam, pillow top and traditional foam mattresses, all at discounted prices. There are an abundance of places to buy a mattress in Seattle on the West side. Right by the water, you’ll find a half dozen mattress shops, including a number of specialty stores. One such store with excellent ratings is Essentia – Natural Memory Foam Mattresses (2008 1st Ave), which prides themselves on selling the only genuinely natural memory foam mattresses in the world. Essentia’s showroom, with modern art on the walls and refreshments at the ready, feels more like a boutique than a traditional mattress store, and the staff offer the type of gracious concierge service typical of a very high-end shop. The prices on these all-natural luxury beds are steep, but many customers, including a number of pro athletes, swear they are worth every penny. Located less than a block away is another stylish, luxurious and innovative mattress store: Tuft and Needle (2030 1st Ave Suite 100). The light, sleek and airy showroom make this mattress store feel more like an art gallery, and customers love the shopping experience, which is facilitated by friendly sales associates. Tuft and Needle sells signature foam mattresses made with heat wicking graphite and cooling gel, surrounded by a breathable cover.